ISO/IEC 27001 (ISMS) course enables participants to learn about the best practices for implementing and managing an Information Security Management System (ISMS) as specified in ISO/IEC 27001:2013, as well as the best practices for implementing the information security controls of the eleven domains of the ISO 27002. This training also helps to understand how ISO/IEC 27001 and ISO 27002 relate with ISO 27003 (Guidelines for the implementation of an ISMS), ISO 27004 (Measurement of information security) and ISO 27005 (Risk Management in Information Security). PECB Exam Fee 100$ NOT included in Training Fee. 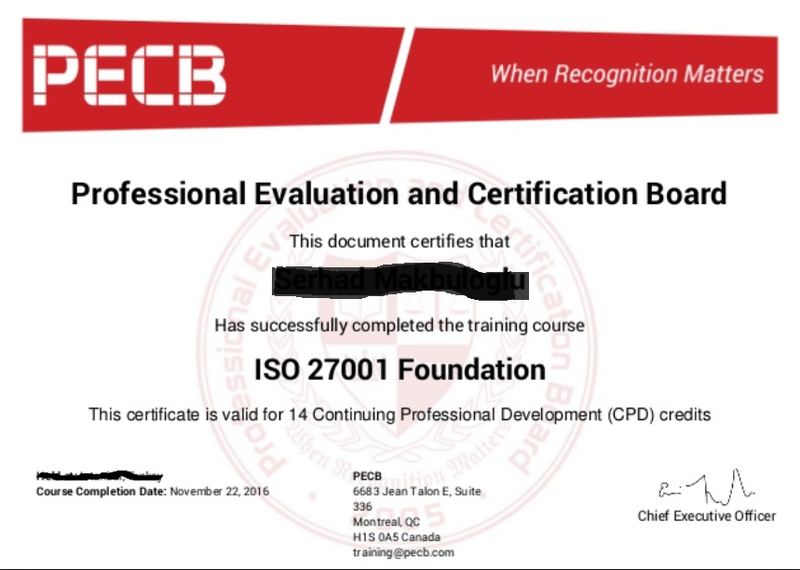 The “PECB Certified ISO/IEC 27001 Foundation” exam fully meets the requirements of the PECB Examination Certification Programme (ECP).